Rag rugs are typically made by pushing small strips of fabric, often recycled, through a base material, made usually of hessian or wool. Hessian is a strong and coarse fabric made from jute or hemp. Although vintage and antique rag rugs are highly decorative and charming, they were originally made purely for utilitarian purposes. The exact place of origin of rag rugs is debatable, but it is believed they were first made in the 17th or 18th century by impoverished women in Western Europe and Scandinavia as an inexpensive alternative floor covering that conserved heat, padded floors, and added color to their homes. They collected scraps of fabric, such as garments, pieces of quilts, and leftovers from sewing projects, and used the “rags” to create the rugs, which is how these folk pieces got their name. 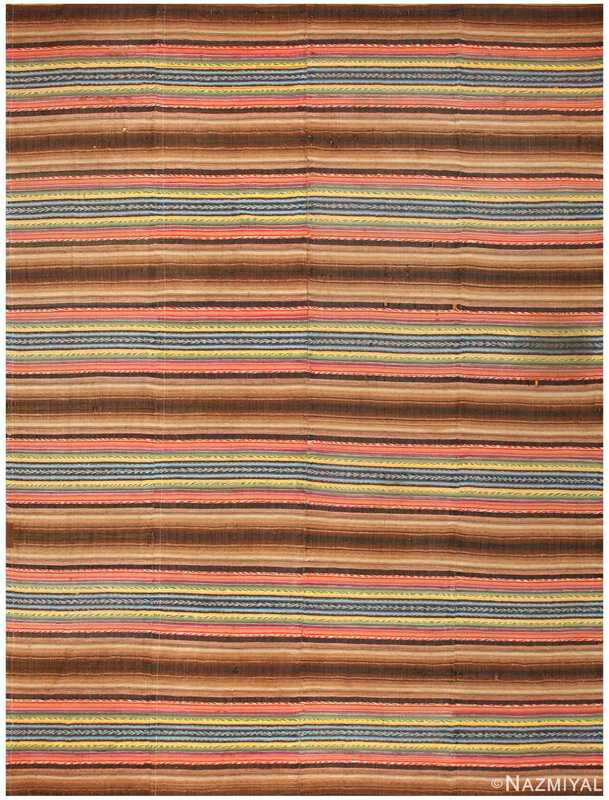 The oldest surviving rug of this type in England, is said to be made from the uniforms worn by British soldiers during the 1815 battle of Waterloo. There are two specimens, however, made in the USA that are even older than that. One dates back to 1763 and the other to 1773, and were made by early European immigrants. The women who wove rag rugs did so by cutting scraps of fabric into long strips and sewing them together, then winding them into large balls of fabric ribbon. They then pushed the fabric strip through a hessian base employing various techniques, such as weaving, hooking, knotting, crocheting, and braiding. Owing to the different techniques used to make the rugs and thanks to the mixed scraps, they are available in a wide variety of designs, patterns and colors. In the United States, rag rugs were first brought to New England during the colonial era. Since the population of the colonies were made largely of impoverished immigrants from England and Europe, the rugs soon found a favored place in many homes. During the westward expansion of the USA, these rugs became a specialty on the frontier because they were durable, required few materials, and were easy to make. Meanwhile, in Europe and Scandinavia, the popularity of these types of rugs continued to increase with the expansion of wool mills, which allowed workers to take home scraps that could be used in home rug production. Scandinavian rag rugs are particularly prized today, because they combine simple and modern Scandinavian design with the charm of folk craft. During the 20th century, many Scandinavian rag rugs were made with minimalist patterns and stripes reminiscent of the Bauhaus and Danish Moderne styles. 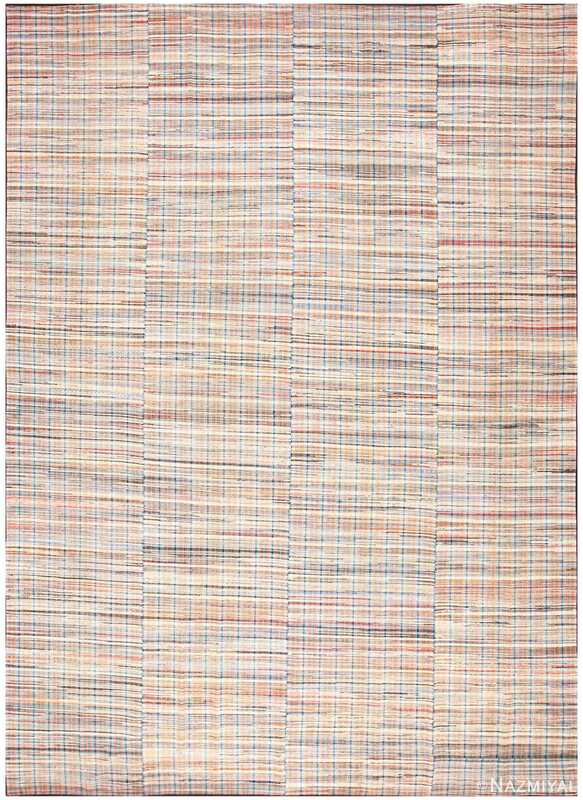 These rugs’ modern yet folksy aesthetic makes them a lovely choice for contemporary interiors. Below you will find our current collection of vintage and antique rag rugs. During the Colonial area, the antique these rugs were a great way for people to cover the floors, add some color and warmth while keeping the costs relatively low. Over the years, the rag rugs have been becoming increasingly more desirable and coveted by interior designers and private consumers from all walks of life. The antique rag rugs have a casual elegance that makes them versatile in many different decorating approaches. From mid century modern NYC lofts interiors to traditional or rustic country homes, these carpets are amazingly decorative items that effortlessly enhance their surroundings. A crackling fireplace, overstuffed chairs and Rag rugs. That’s the image of American casual comfort. These semi flat woven rugs have a casual, inviting style, and they certainly qualify as Americana. These functional relics of the past and many were made from carefully collected scraps. Their unique appearance and cultural significance helped these extraordinary antique rugs go from humble crafts to highly coveted pieces of history that represent pure American style. A hand-woven or machine-made rag rug is usually made with cotton warps and a filling of rags torn into strips whose ends are tied or sewed together. Particularly in the eastern United States, textile workers as well as just regular people, gathered wool scraps from weaving and knitting factories or old clothing, to create rugs for their own homes. The unique look and durability of these Americana rugs cannot be produced any other way. For a quaint relaxed, casual or country feeling, rag rugs are must-have items. This bold vintage Scandinavian rag rug showcases a superb, carefully blended conglomeration of chic retro colors woven in an endless pattern of layered stripes. Crafted in the mid-20th century, this vintage Swedish rag rug depicts a stunning assortment of artful textures and vibrant colors that are beautifully interspersed. 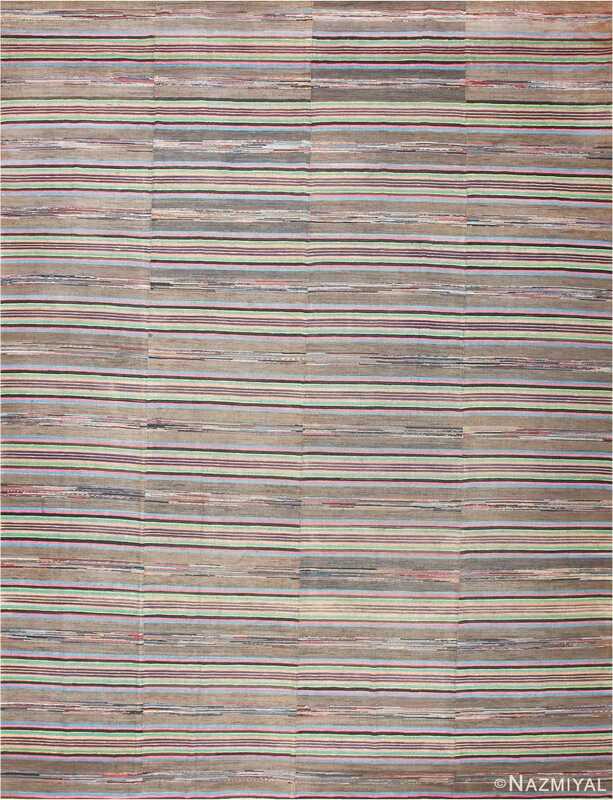 This distinctive Swedish rag rug displays a wildly striped, richly variegated visage incorporating grounded earth tones, saturated aquatic colors and chic neutrals. Woven from a colorful melange of textural fibers, this vintage Swedish rag rug is a whimsical work of art with outstanding rustic and modern appeal.